Ate too much? 5 ways to bounce back! Our approach to nutrition at The Bod takes life into consideration. That means we know and understand there will be times that you eat out, times where you slip up and times you have a food binge or blowout. A binge is defined as: "a period of excessive indulgence in an activity, especially drinking alcohol or eating"
And a blowout as: "a large or lavish meal or social gathering"
The physical effects to your body after going through a binge or blowout are pretty instant. Your stomach feels rock hard, your head's throbbing and you feel achy all over. It feels like a food hangover. Other immediate side-effects to an unhealthy eating habit such as bingeing episodes can be nausea, immediate weight gain and irritation. Mentally coping with the after-effects of a binge or blowout can be incredibly debilitating as well. You can start to self-loathe and experience extreme guilt. Many of you have been asking us what is the best way to approach the aftermath of an episode of overeating. Whether it's a full-on binge or a lesser scale indulgence ... we've got answers for you below. The time you waste on regret could be better used elsewhere. Instead of hating yourself, find out why your cravings came about and learn how to pick up on signs earlier. Did you know that a craving for salty food could actually indicate low levels of calcium? And if you're craving something sweet, you might really need some magnesium-rich foods! Prevention is always better than cure, right? Often, your first thought will be to go into starvation mode to 'make up' for the calories you've over-eaten. This kind of punishment mindset is one we want you to avoid. Any kind of drastic starvation causes your metabolism to slow down and your body to use the smallest amount of energy as possible. This suggests the minute you do eat something substantial, you can actually gain weight. When you're body is in a 'fasted state', your insulin (blood sugar) levels begin to drop, and when you finally do eat, your blood sugar spikes and your body reacts by storing and reserving fat as a mode of survival. 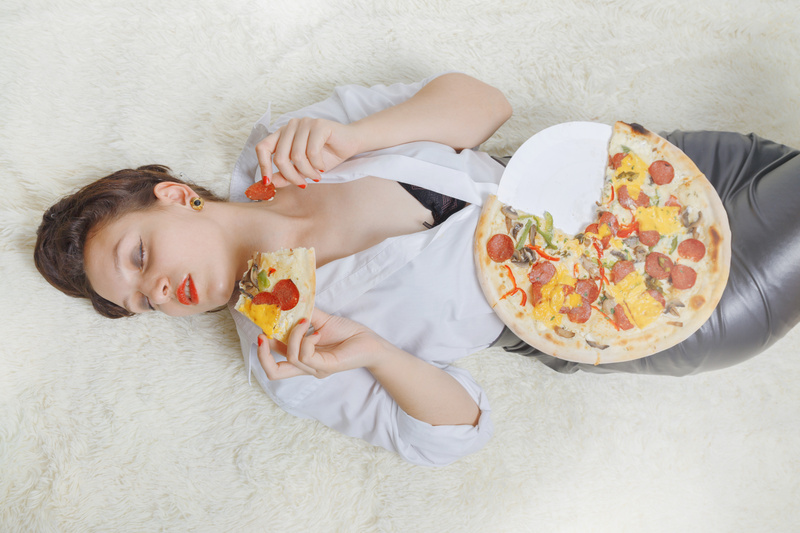 The stress hormone cortisol and fatty foods go hand in hand. "Physical or emotional distress increases the intake of food high in fat, sugar, or both." Research also shows a link between increased levels of the stress hormone cortisol and higher insulin levels - your blood sugar drops and you turn to sugary, fatty foods. Turn to exercise to alleviate any raging headaches or soreness - not to punish yourself. You can aid the digestion process by going for a light walk, or change your environment by heading outdoors or to the gym. We'd also suggest trying some aerobic or endurance exercise, which studies have proven to help not only your heart, but headspace too. If you are just in the middle of a food-laden weekend or huge late-night binge; stop right there. It's completely fine to accept where you are at this point in time now. What is not okay is taking these circumstances and using it as an excuse to go on a full-blown binge all week or weekend. “I am no longer hungry, I have the power to stop this potential blowout in its tracks. It hasn't been my best eating day, but it won't be my worst." What if my blowout is on a smaller scale? If this is the case, and you may have not tracked your macros perfectly or slightly indulged over the weekend - go straight back onto your macros. Don't under-eat for the next few days to compensate for overeating when in the grand scheme of things, it won't affect your overall journey dramatically. You are better off kickstarting your day with a nutritious meal to change your mindset over anything else! Are you often getting to the point of 'I ate too much', and sick of it? Reach out to our coaches and learn which sustainable meal plan is for you! Take a look at our programs here.